ADC Student to be Featured in the Bright Lights of Times Square in New York City! This is the photo that will be featured in Times Square! Paloma Flores-Alvarez, of the Foster Schmidt Dance Academy for Down Syndrome, will appear in the bright lights of Broadway on Saturday, September 21, as part of the National Down Syndrome Society’s (NDSS) annual Times Square Video presentation. The featured photographs highlight children, teens and adults with Down syndrome working, playing and learning alongside friends and family. These collective images promote the value, acceptance and inclusion of people with Down syndrome, which is the NDSS mission. The photo of Paloma was selected from over 1,000 entries in the NDSS worldwide call for photos. Over 200 photographs will appear in the video, which will be shown on the News Corporation Sony Screen, located in the heart of Times Square. Paloma is pictured dancing on stage in Atlanta Dance Central’s May Recital. 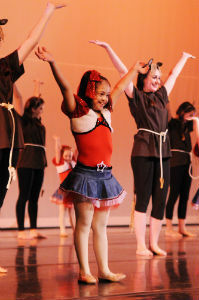 She is a member of the Foster-Schmidt Dance Academy for Down Syndrome! The Times Square Video presentation kicks off Down Syndrome Awareness Month in October. The video presentation will be followed by the 19th Annual Flagship Buddy Walk® in New York City. This year, Buddy Walk® events will be held in more than 250 cities across the country, as well as select international locations, in and around October. For information about the NDSS National Buddy Walk® Program, visit www.buddywalk.org or call 800-221-4602. The National Down Syndrome Society is a nonprofit organization with more than 375 affiliates nationwide representing over 400,000 Americans who have Down syndrome. The mission of NDSS is to be the national advocate for the value, acceptance and inclusion of people with Down syndrome. NDSS envisions a world in which all people with Down syndrome have the opportunity to enhance their quality of life, realize their life aspirations, and become valued members of welcoming communities. For more information visit www.ndss.org.